When you are working with an existing brush it may be necessary to add or remove 3D models, or even transfer them from one brush to another without rebuilding them. After each modification, don’t forget to save your brush by either overwriting it or creating a new brush. The features to manage the models included in your brushes, located in the Brush palette. Select the brush that you want to edit and, with a SubTool compatible with VDM (grid based) loaded, click the Brush >> From Mesh button. The model will be added to the current Alpha 3D brush, placed at the end of the Content Browser. Select the brush that you want to edit and in the Content Browser, select the VDM to delete. 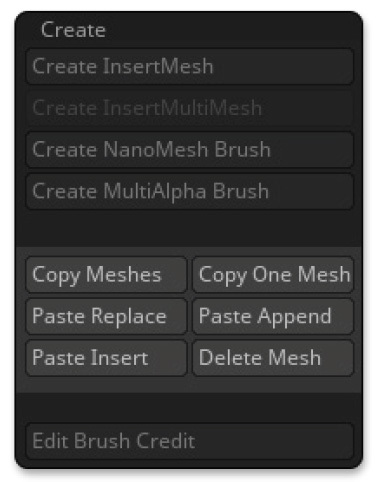 Click Brush >> Create >> Delete Mesh. In the Brush >> Create sub-palette, you can find multiple functions to pass your mod­els from one brush to another. The process is always the same, copying a single VDM (or all VDMs) from the current brush, then selecting another brush and pasting the content into it. You can paste to append, adding the VDMs to those already found in the brush. Or you can paste to replace, deleting all original content.